Monetary policy characterisations across countries rely on the availability of data, but while exchange rate classifications are well developed, the same is not true for domestic targets. This column introduces a new classification of the monetary policy frameworks of different advanced and emerging countries, including domestic and external targets. One trend revealed by the classification is the movement over time away from exchange rate targets and loosely structured discretion towards inflation targeting. There has long been a need for an accurate and detailed characterisation of the monetary policy frameworks of different countries that brings together domestic (e.g. money or inflation) and exchange rate targets of different kinds. There are at least two detailed and substantial classifications of exchange rate regimes (Reinhart and Rogoff 2004, Levy Yeyati and Sturzenegger 2005; see also Tavlas et al. 2008). These were in part stimulated by the work of Calvo and Reinhart (2002), who showed the extent to which countries' declarations of their exchange rate regimes (a requirement of IMF membership) differed from their practice. Discussions of the domestic variables targeted, however, tend to rely on monetary authorities' own statements of their targets and do not often consider the extent to which these are realised. A comprehensive classification of monetary policy frameworks, covering both external and domestic targets and taking account of actions as well as deeds, is now available in a new dataset at www.monetaryframeworks.org. Monetary policy frameworks are taken to refer to “the objectives and the context that condition monetary policy decisions: primarily the objectives pursued by the monetary authorities, but also the constraints and conventions within which monetary policy decisions are taken”. The classification is based on a source that has not been used much so far, but has become widely available online in recent years, namely, the IMF's Article IV consultation reports with each of its members. These reports cover monetary and exchange rate policy as well as fiscal and other policies. These reports are 'real time', insofar as the consultations occur every one to two years. They include country-specific data (e.g. on currency baskets or monetary aggregate definitions) which are not always available in sources such as the IMF's International Financial Statistics. Furthermore, they highlight differences of emphasis and opinion between the local authorities and the IMF staff doing the consultation. Have the authorities announced some specific targets, or do they exercise discretion? Are the targets for the exchange rate, or money or inflation (or something else)? Are the targets precise and narrow, or wide and broad-brush? Are they stationary or converging? If there are no announced targets, is the policy framework well defined and clearly structured, that is, do the authorities have both a clear view of what they want and the means to achieve their various objectives? In the absence of announced targets, where the objectives are unspecified and maybe even unclear (and/or changing over time), there is no alternative but to focus in part on the monetary instruments available – i.e. would the monetary authorities be capable of targeting one or other variable even if they wished to do so? This leads to an emphasis on the financial infrastructure – especially government bond and interbank money markets, but also institutional elements such as central bank independence – as key elements of the frameworks, that is, as part of the context within which monetary policy decisions are taken, elements which are secondary to the objectives of monetary policy but condition the choices of those objectives. That emphasis then contributes, together with what information on objectives is available, to a distinction between three types of discretion: unstructured, loosely structured, and well structured. In addition, for emerging economies the classification differentiates between an exchange rate ‘fix’ where the central bank in effect sets the rate in a market that it dominates, and an exchange rate ‘target’ where there is an autonomous forex market in which the central bank intervenes from time to time. The fix is divided into 'pure' and 'augmented' on the basis of the existence and use of other monetary instruments, and a similar distinction is made for currency boards. Operationalising these distinctions requires precise criteria, which are set out in the full exposition of the classification in my recent work (Cobham 2018). That produces a total of 32 monetary frameworks – which is too many for many purposes – but the classification has been constructed with an eye to aggregation. In my paper I suggest two aggregations in particular – one by target variable and one by 'stage of development' – and researchers may well wish to construct their own aggregations. So far, the classification has been implemented for 26 'advanced' countries plus the euro area and 33 'emerging' economies over the post-Bretton Woods period 1974-2014. The plan is to extend this to another 100 or so developing countries, by region, starting with the Middle East and North Africa, and then Latin America, and to update it at intervals. 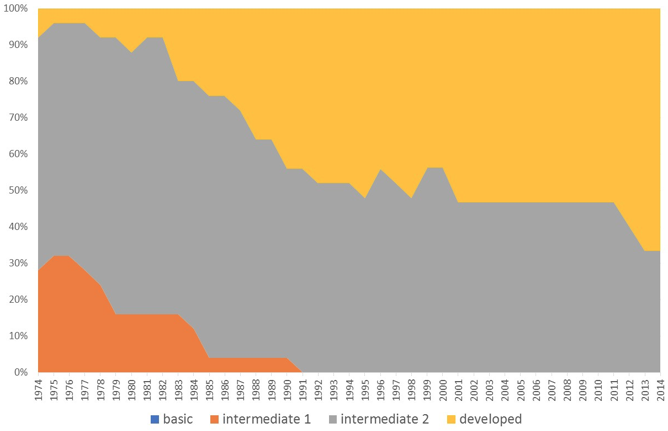 For the target variable aggregation, the percentage of countries in each category over time is shown in Figure 1 for advanced countries ('no national frameworks' refers essentially to membership of a currency union, with the euro area included in its own right from 1999). The same is shown for emerging economies in Figure 2. The main trend visible here is the movement over time away from exchange rate targets and loosely structured discretion towards inflation targeting (the euro area is identified as a 'loose' rather than 'full' inflation targetter). 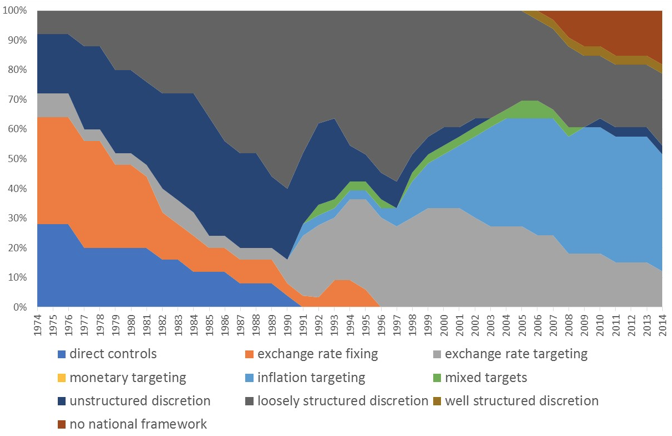 This trend is stronger and earlier for the advanced countries (particularly with the euro area treated as inflation targeting) than for the emerging economies, among which there is in the earlier years a significant amount of direct controls (command economy), unstructured discretion and exchange rate fixing, and an important amount of exchange rate targeting persists. It is also worth noting that while there is some monetary targeting for the advanced economies in the earlier years (and some mixed targets that included money in the run-up to EMU), overall the significance of monetary targeting is lower than might have been expected. The main reason for this is that so many monetary targets were missed. In many cases, countries are classified instead as 'loosely structured discretion', which means that the authorities' instruments were ineffective and/or they were not clear about their objectives and the trade-offs between them. For the stage of development aggregation, which goes from 'basic' (direct controls or pure exchange rate fix) through 'intermediate 1' (e.g. 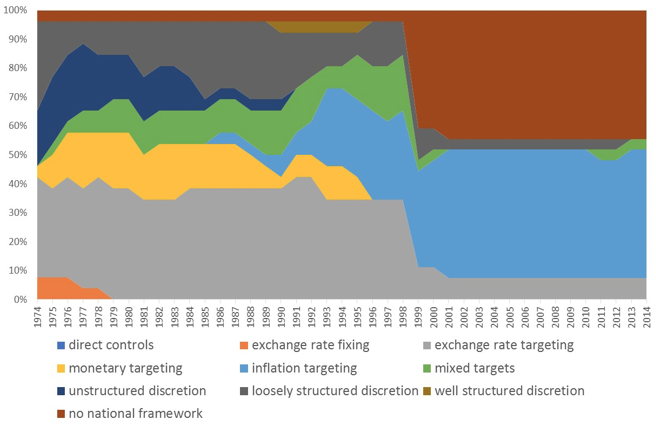 augmented exchange rate fix, pure currency board, 'unstructured' discretion) and 'intermediate 2' (mainly loose targets of various kinds and loosely structured discretion) to 'developed' (full targeting of inflation or some other variable, or well-structured discretion), the advanced economies perform as shown in Figure 3. Figure 4 shows the same for emerging economies. 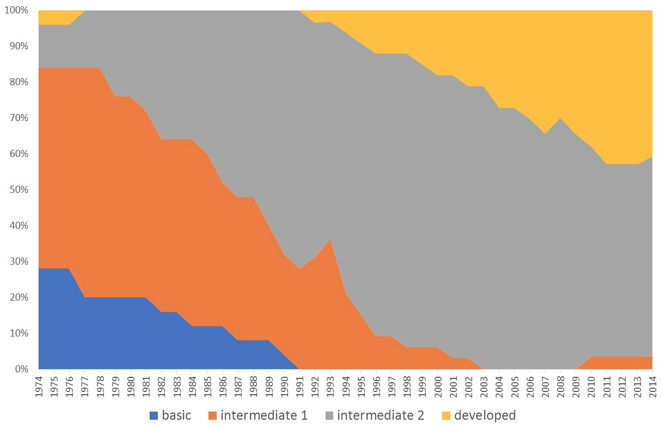 Here the main trend is towards developed and away from less developed frameworks, and this is unsurprisingly stronger and more complete for the advanced economies (which have no examples of basic frameworks in this period). The dataset provides the information for the full classification and for the two aggregations shown above, while a detailed explanation of the methodology is given in my associated paper (Cobham 2018). The website also has a table for each country showing the way it has been classified, with selected references to relevant IMF documents and additional sources that provide the rationale for the classification in each subperiod. The intention is that the data should be available as a resource for other researchers, who may, for example, wish to construct their own different aggregations. As indicated above, the classification will be applied over time to increasing numbers of developing countries. It should be useful in a range of research, from work on the basic economic performance associated with different frameworks (such as inflation targeting) to the effect of different frameworks on specific economic outcomes in, for example, the Global Crisis. Calvo, G, and C Reinhart (2002), “Fear of floating”, Quarterly Journal of Economics, 107, 379-408. Cobham, D (2018), “A comprehensive classification of monetary policy frameworks in advanced and emerging economies”, Heriot-Watt University Economics Discussion Paper 2018-01. Also MPRA Paper no. 84737. Levy-Yeyati, E, and F Sturzenegger (2005), “Classifying Exchange rate Regimes: Deeds vs. Words”, European Economic Review, 49 (6): 1603-35. Reinhart, C, and K Rogoff (2004), “The modern history of exchange rate arrangements: a reinterpretation”, Quarterly Journal of Economics, 119 (1): 1-48. Tavlas, G, H Dellas, and A Stockman (2008), “The classification and performance of alternative exchange-rate systems”, European Economic Review, 52 (6): 941-63.